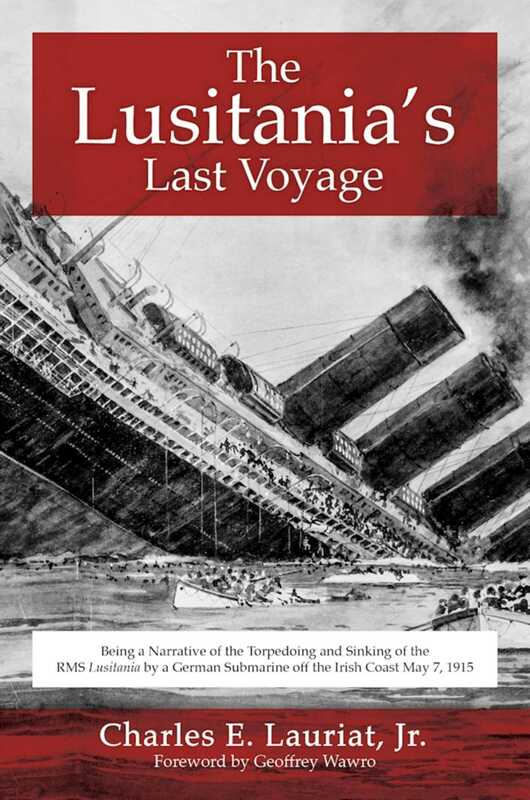 By Charles E. Lauriat Jr.
A first-hand account of the Lusitania’s doomed final voyage. On May 7, 1915, the German U-boat U-20 fired a torpedo into the side of the passenger liner R.M.S. Lusitania as it passed the Old Head of Kinsale in Ireland on its way to Liverpool, England. This act of war had a terrible tollof the 1,962 passengers and crew, 1,191 lost their lives, many of them women and children. One of the passengers on the ship was Charles E. Lauriat, Jr., a rare book dealer who traveled regularly to London for business. When the German embassy placed a warning notice in several New York papers stating that any ships of Great Britain and her allies would be considered fair targets, Lauriat, along with most of the other passengers, dismissed the notion that a civilian liner would actually be attacked. Lauriat’s memoir of the journey recreates the torpedo attackdescribing the listing ship as it filled with water and people scrambled for lifeboats, too often finding them inaccessible or unusableand details the rescue that came too late for most of his fellow passengers. Lauriat then points out the many faults of the official inquiry, telling the true story of that tragic day. With a new foreword and photos of the ship, The Lusitania’s Last Voyage is a gripping account of one of history’s greatest naval disasters. Skyhorse Publishing, along with our Arcade, Good Books, Sports Publishing, and Yucca imprints, is proud to publish a broad range of biographies, autobiographies, and memoirs. Our list includes biographies on well-known historical figures like Benjamin Franklin, Nelson Mandela, and Alexander Graham Bell, as well as villains from history, such as Heinrich Himmler, John Wayne Gacy, and O. J. Simpson. We have also published survivor stories of World War II, memoirs about overcoming adversity, first-hand tales of adventure, and much more. While not every title we publish becomes a New York Times bestseller or a national bestseller, we are committed to books on subjects that are sometimes overlooked and to authors whose work might not otherwise find a home.